Assured Labor is specialize in low-wage recruitment in Brazil and Mexico. It has more than 1 million candidates subscribed between the two countries and around 45.000 companies posting their jobs. 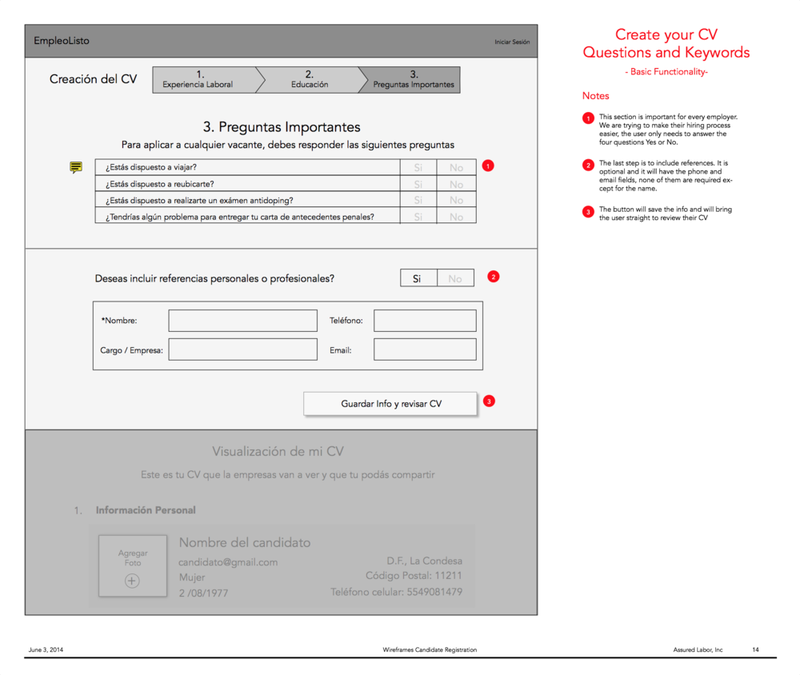 During almost 3 years, I had the opportunity to lead the design of the product, starting with the brand and visual design, working on the new flow for the employer dashboard, simplified registration process for candidates and more recently developing the concept of a new product : an android app for candidates, that made us rethink the business model by combining the sign up process and the creation of the resume into one single process and redefining the role of the customer service and admins of the company. Low-wage people in Brazil and Mexico. Ages 18-45 years old. People with little or no education. Some are looking for their first job. These people need their jobs to support their families. Human Resources employees of small and big companies. People that doesn't spent too much time hiring for low-wage positions. 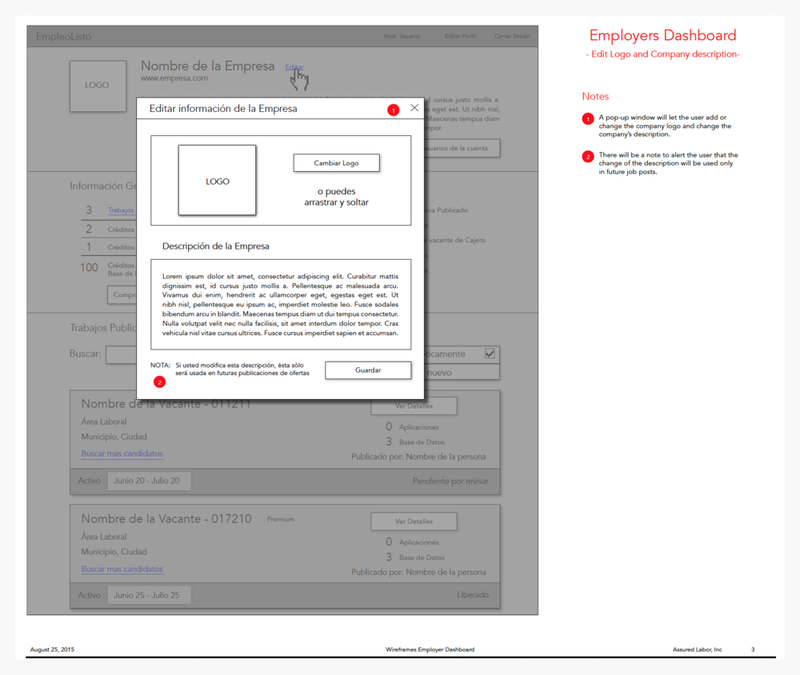 EmpleoListo Employer Dashboard was the first feature that I redesigned. It was important to start with this user, because they are the ones paying for the service and from the business perspective, we needed to improve their experience to make them post more jobs. 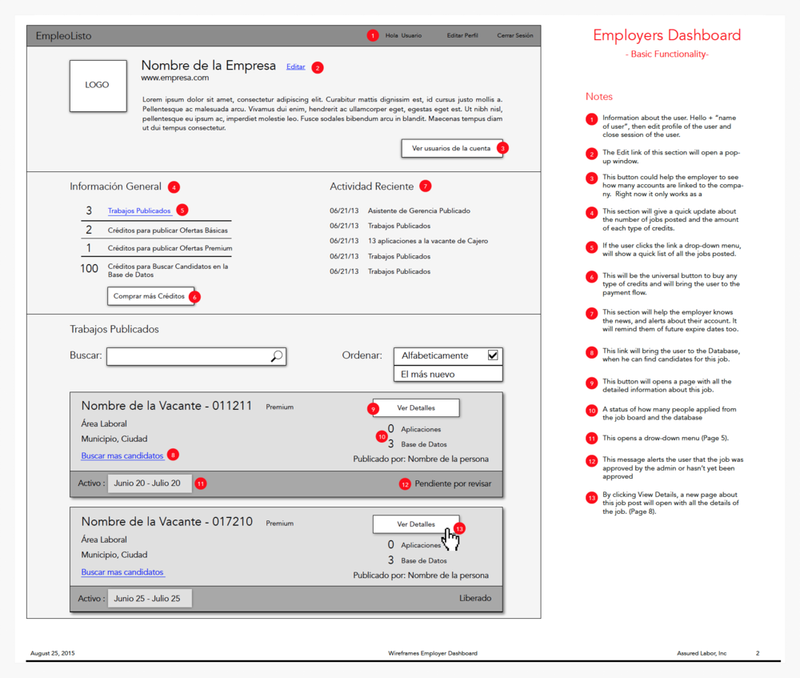 This product let the employers see their account status, job posts and rate candidates. I created a style-guide that was then implemented throughout the platform. Defining the scope of the project with the engineering team, and deciding an agile methodology in which we can iterate fast based on analytics that we were getting, was as important as the design itself. Working in a small startup gives you a global perspective of the business objectives and how to achieve from the work you are doing. One of the first things I needed to do was to organize the information of all the candidates that applied for a job. What was the right information architecture that would help the user make their job faster and easier? To do this, we interviewed various companies to ask them what they wanted to see in the dashboard. How much time do you spent recruiting for a low-wage job in your company? How often do you have to hire for this job? What is the most important thing that you look on a candidate? How many stakeholders are involved in the hiring decision? What are the most important things you look on a candidate? We needed to introduce the new dashboard and measure it success. We decided to do an A/B test, supported by a marketing campaign and a tutorial to help our employers understand how to use it. We start switching like 10% of the companies into the new dashboard, until we had 100% of them with the new dashboard. No matter how many flaws the design had, it was infinite better than what we had. Our marketing and sales team had the strategy of giving employers one free post, but they didn't realized that the people in emerging markets will do anything for a free thing, so employers posted similar jobs for the same company but they change the name by adding just one more character. We had a lot of duplicate jobs. Companies that work with branches, for example, Pizza Hut, where posting 700 jobs of delivery guys for all their branches. The design was not prepared to manage this company in our dashboard. 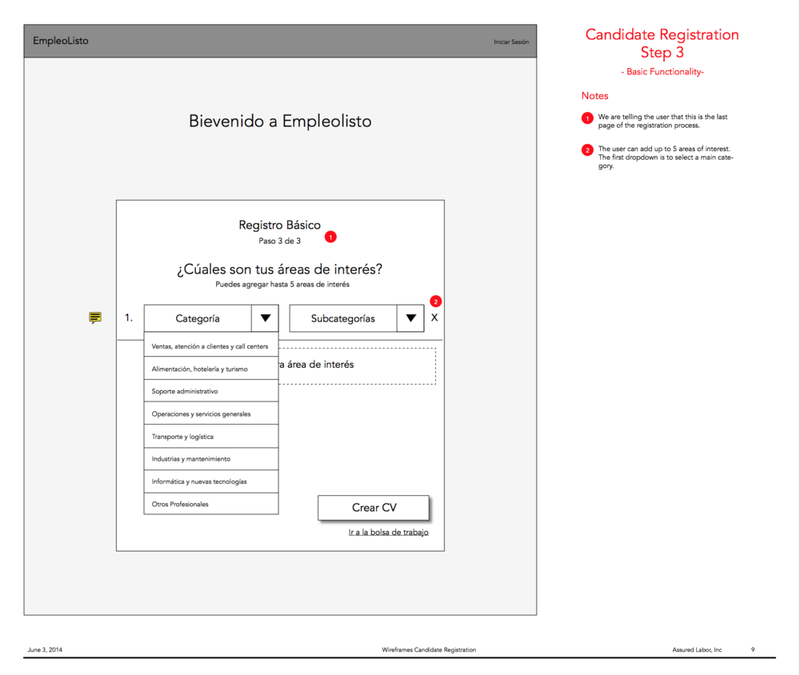 Some jobs were receiving more than 500 candidates, which was hard to search in the dashboard. The Mexico team develop a excel tool to search for queries in the database that will allow the admins to help these employers without the need of the dashboard. I realized that it was more important to focus on building good tools for the admins before we focus on our users. 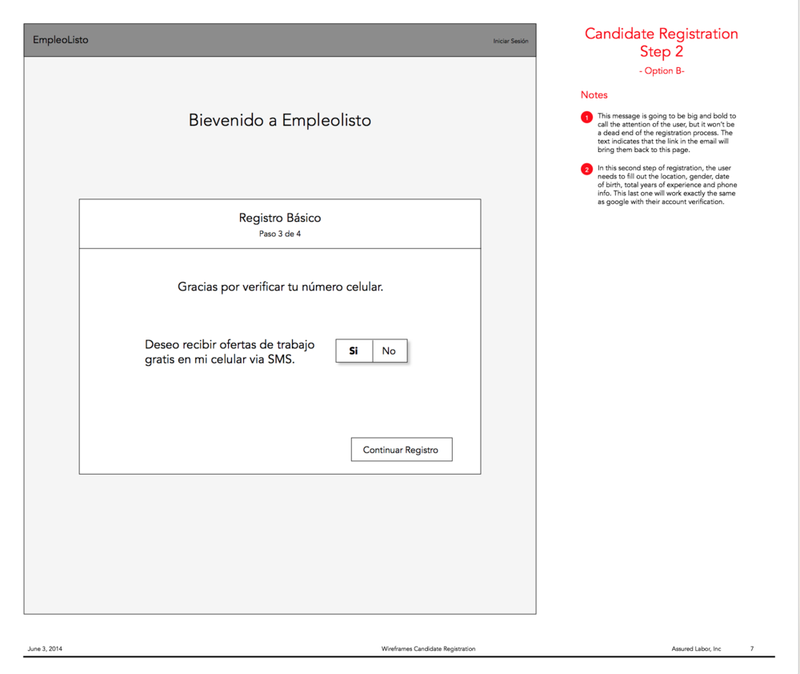 Just after I finished working on the employer dashboard, I knew I needed to focus on the candidate registration process. Our users deserved a better experience. 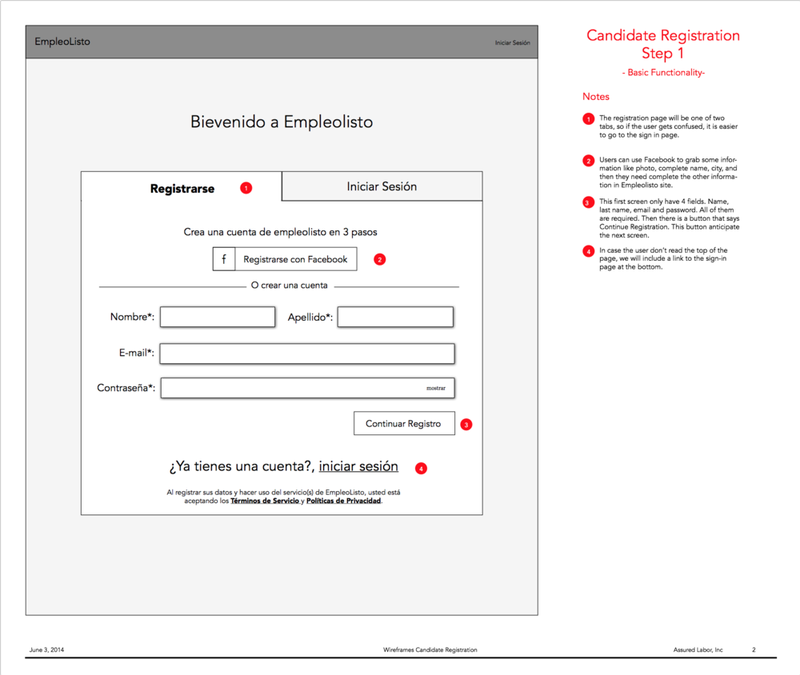 I designed a more organized process, gathering the real data that our employers needed from the candidates. 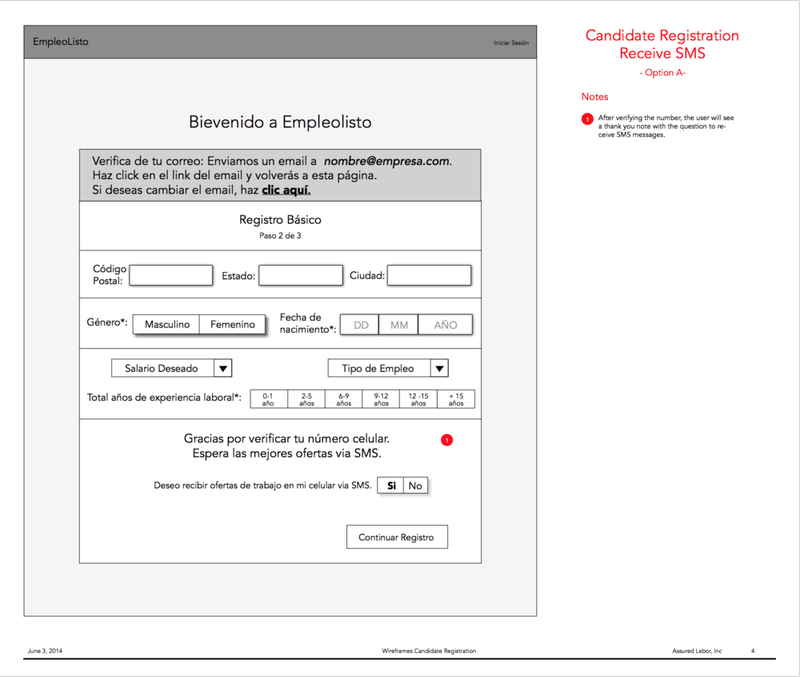 Half way into this process, we realized the need to develop an app that could help us subscribe more candidates in a fast and easy way. This shift made us rethink the overall product and we start building a separate product from scratch that we believe would make us strong with our competitors in both countries. Reducing the amount of categories to chose was great, but the idea of creating sub-categories was complicated and most of the users didn't understand why we needed that amount of information. We were ready to develop a product from scratch that was more in sync with the philosophy of Assured Labor. A revolutionary experience that would be mobile only for our candidates and would also help the employers reduce the time they spent hiring for this positions. At the same time, we thought about our admins and how can we start shifting their roles to do less manual work and to help the employers take advantage of this new tool. Are you interested in the job? We were able to test the app in Mexico with real users. We used one neighborhood in Mexico City and run a test for a week to understand the users behavior. We spent a lot of time with the tech team talking about the best strategy to migrating the old data to the new app. It was a big challenge to map the old categories with the new ones. I rely on a lot of research and user testing. I conducted interviews with all the users and try to understand what the product needed to be. I learned the value of user research, the importance of being in their shoes and to work fast creating an easy MVP that we can start iterating. In 2015 Assured Labor closed their NY and Brazil office, focusing the business in Mexico. In 2016 the company was sold to the leader in recruitment in Mexico OCC Mundial.